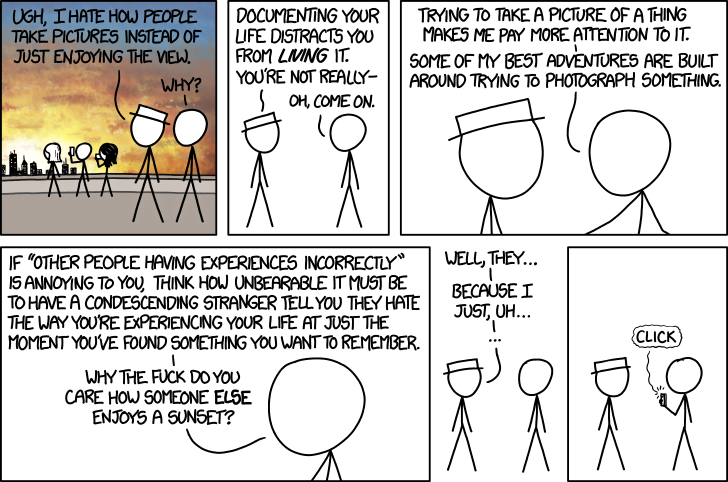 XKCD Comic: Does Documenting Your Life Actually Distract You From Enjoying It? Comic extraordinaire XKCD thinks we should give stop criticizing people for doing what they love – like, photographing food and sunsets. Also, sunsets, and then food. If “other people having experiences incorrectly” is annoying to you, think how unbearable it must be to have a condescending stranger tell you they hate the way you’re experiencing your life at just the moment you’ve found something you want to remember. What do you think? We think it’s not a bad idea to play nice.